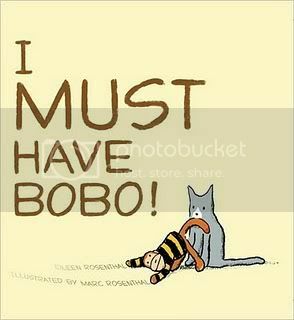 This tale of a boy and his favorite toy, a stuffed monkey called Bobo, has a classic and timeless feel. Marc Rosenthal's illustrations which typically hearken back to the 1950's, especially in Phooey! and the madly wonderful picture book, The Runaway Beard feel slightly updated here, with more close-ups and a looser, sketchier feel. The husband-wife, writer-illustrator team do a great job of pairing fairly simple text with expressive illustrations. The emotional intensity and devotion that the little boy feels towards Bobo clearly come across. Whether he's playing with blocks, braving the extra-tall slide at the park, sneaking past the big dog down the street or snugging into bed, Bobo is a necessary companion. Unfortunately, the family cat, Earl, has other plans. I loved that the cat didn't have a "typical" cat name like Fluffy. I loved seeing the boy scowl, grimace and yell as he gets up on the wrong side of the bed, and finds Bobo (whom he must have by his side!) escaping from him time and time again, courtesy of Earl. I liked the surprise ending, too. The boy finally finds Earl and Bobo curled up on a jumbo armchair. He curls up with both of them for a nap, and the story could have ended very sweetly, right there. Instead, on the next page turn, we get a tongue-in-cheek humorous ending, seeing once the boy is asleep, Earl brazenly sneaks off with Bobo, once again! Recommended for ages 3-5.